Shopify review – Is Shopify good for your store and worth the price? 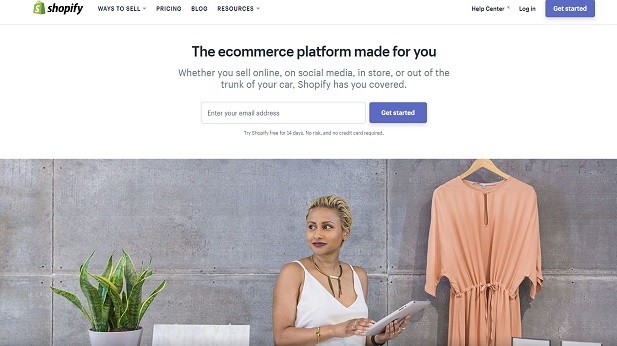 » Shopify review – Is Shopify good for your store and worth the price? Shopify review - How good is shopify? Shopify is at the moment the most popular e-commerce platform. And indeed there are currently more than 500,000 stores online that are run on the company's ecommerce solution. But is the service worth what they charge for it? After all popularity doesn't always equal value for money. In this honest review we go through the most important elements of the service and conclude with our answer to the question. Is Shopify safe and legit? Shopify is currently listed in the New York Stock exchange (you can see the latest information here) and has a market cap of around $10 billion at the moment. The fact that the company is publicly listed means that there is an added amount of transparency about its business when comparing the company to many other companies that provide a similar service. At the moment there is no indication Shopify would be dishonest or that it might disappear. And indeed it is quite possible that Shopify is the most reliable e-commerce platform provider. When it comes to your personal Shopify store, it is good to note that all their plans include, for example, a free SSL certificate, which adds an layer of security to using your online store. Also, on a personal level I can say that during the last few years that I have followed Shopify closely and also used some of their services, I have never seen any indication of them being nothing but safe and honest in their operations. When you first arrive to Shopify's website you will notice that it loads fast and it is easy to see the buttons inviting you to signup. In the first stage of signup they ask for your email, password and store name (this can be easily changed later on), after that they ask for more of the usual details such as address and phone number, in the third signup form they ask for couple small details about your store. In total filling those 3 signup forms took us from around 45 seconds. One of the best things about the signup experience was the fact that they don't ask for your credit card or other payment details when simply signing up. You will need to provide those only when you start actually selling products in your store. At the moment Shopify has three different actual plans available for their customers. In addition to that they also have plan that is exclusively for selling through Facebook as well as "Shopify Plus" solution which is intended for really big stores and is modified more heavily on the needs of each individual customer. Out of the plans the The Facebook plan is the cheapest costing only $9/month. The cheapest of the actual plans in called "Basic Shopify" and it costs $29 per month when paid in month-to-month. The medium plan is called simply "Shopify" and it costs $79 when paid in monthly basis. The most expensive plan is called Advanced Shopify and it currently costs $299 per month. It is important to note that it is possible to get a significant discount on the prices of the plans when you pay for a full year or two years in advance. If you pay for the year you get a 10% discount and when paying for two years you get 20% off. The prices of Shopify's plan are pretty much in line with what other big ecommerce platform providers charge. When considering which plan to go with it, it is important to pay attention to the fact that Shopify chargers different credit card rates and different rates when customers use external payment gateways. Meaning that, it might actually be cheaper all together to go with a more expensive plan and have lower payment fees than to go with a cheaper plan and have to pay higher fees. As you can change the plans quite easily, nothing stops you from trying a plan and then upgrading or downgrading based on which plan seems like the cheapest option all things considered. The features of the different plans are quite similar, but something to keep in mind is the fact that the cheapest plan doesn't include the option to have gift cards in your store nor does it include the abandoned cart recovery. Ready to open your Shopify account? 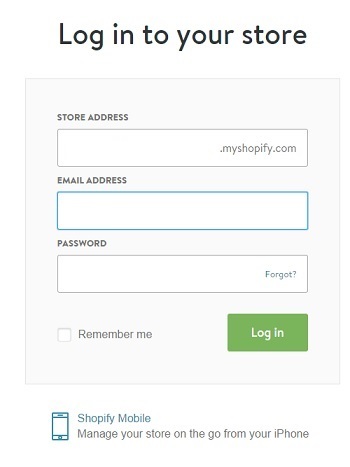 Once you have signed up you can log in to your admin panel directly on Shopify's website. Once logged in you can use the easy-to-use admin panel to edit your store. All the parts of the admin panel are easy to use. When adding a new product you simply write the details of the product in couple fill-in boxes and upload the image of the product (if you would like to) and hit the "save product" button. The same logic works for other parts of the shop too, including for an example adding the shipping fee and creating discount codes. It is also nice that the admin panel has the feature to add information about the quantity of each product you have immediately available for shipping to the customers. Order notifications: one very obvious, but still an extremely, nice feature that Shopify offers is the notifications when someone makes an order. When an order is placed the systems sends you an automatic email that includes all the important information about the order so that you can process it. It is also possible to set-up text message notifications, which work well for an example in USA and Canada. In case you want to publish content related, for an example, to the items you are selling in your store that is also easy by using the features that allow you create new pages and post new blog posts. In addition to the option of editing your store the back-end offers you also detailed reports of all the important things such orders and sales. When you first start using Shopify it will by default launch your website with a very simple theme called Launchpad Start. If you are believer in "small is beautiful", this might actually be the theme that you end running your store with in the long term. It contains everything that online shop needs, but nothing more; no flashy graphics or complicated navigation bars. However, if you would like to change your theme that is extremely easy. Simply in your admin panel go to themes -> upload a theme and in the small pop-up window that comes choose to go to the Shopify theme store. When you are in the theme store simply choose a theme you like (free or paid), click on it and follow the simple instructions to activate it as your store's theme. As returning customers can get quite confused if the look of your store changes radically, it is good to spend a considerable amount of time when choosing the theme you would like to use for your store, so you don't have to abandon it. At the moment Shopify offers bit over 60 themes for their customers, and often within a given theme there are actually different versions of it. Out of the themes only about 10 are at the moment free and for the rest of them you are required to make a one-time payment. For the paid themes the cost per theme is $140 to $180. The cost per theme might seem like quite a large amount, but it is worth keeping in mind that it is very easy to recoup the investment if the theme entices people to make more orders from your store compared to a situation in which you would be using a free theme. It might also be a good idea to mentally split the cost of the template for the duration you plan to use the theme: if you for example believe that you will use it at least for the next two years, the price per month is less than $10/month. 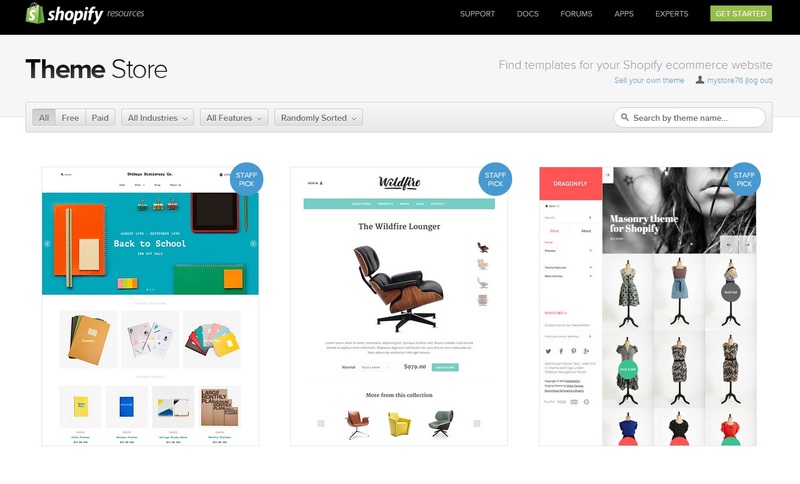 The mentioned number of the templates means that there is one for practically any type of store. It doesn't matter if you are selling mattresses or scented candles, you will always be able to find a template that fits your needs perfectly. Due to the fact that the different Shopify themes tend to go best with different kinds of stores, it is impossible to say what the best theme would be for your store. Personally I would suggest narrowing the choice between themes down to couple you yourself like and then asking for opinions from people you know - preferably ones that are also likely to actually buy from your store, or at least know the topic quite well. When comparing the themes to the themes offered, for example, by Squarespace it can concluded that themes are at least as good. What type of products should you sell in your Shopify store? As mentioned there is a theme that fits every need. However, there are some products that are better for selling online than others. When considering the products you would like to sell, you should, for example, think about how much competition there is in the product category (for a new store in a crowded marketplace it can be hard to convince customer to change to your business), how high profit margins the products offer, are the products easy and cheap to ship and are returns likely? Even though most store-owners naturally go with selling physical products, there is nothing stopping you from selling, either exclusively or alongside with physical products, intangible service-type products, such as online courses or ebooks. Shopify is widely praised for it's quality customer support and in fact the CEO & co-founder of the company, Tobias Lütke, has said that one of the things they really focus on is providing quality customer care to their customers. However, it is clear that almost everyone says only positive things about the customer support provided by "their" company. So we obviously had to try it. We contacted the Shopify's customer service at 3:40 PM CET time via the live chat feature offered on their website. We were immediately connected with a customer service rep (no 5 minute wait like on some sites!) and asked our question. We asked a question that is not the easiest (e.g how expensive is the cheapest monthly plan) and were provided a clear and concise answer within 30 seconds. And the information was correct. So when it comes to the customer service we give full points to Shopify. After the chat is over Shopify sends a copy of the chat log to your email address for future reference. In addition to the live customer chat feature Shopify offers also telephone and email support. Easy. That is the one word that comes constantly to mind when using Shopify. Everything seems to have been built with the no-technical store owned in mind. In other words, you really don't have to be a computer genius to run a store with this platform. And if do happen to run into problems it is good to know that there are plenty of guides available as well as the friendly & knowledgeable support is ready to help you. As you can see above we are mainly very positive about Shopify. However, there are couple small things that are slightly annoying: 1) if you are looking to launch your store in language that is not automatically supported by Shopify (most big languages such as English, German and French are) you will have to manually translate all the different parts of the website when using a ready-to-go theme. It is not difficult, but it takes time. 2) changing the URLs of some of your shops's inner pages is not easy. Is Shopify worth the money? Yes. In my opinion Shopify is at the moment the best e-commerce platform available and also offers great value for the money. When you are thinking about the amount of money they charge for running an online store via the Shopify platform, it is good to compare the amount to the costs that running a physical store would create. This means that you should really view the monthly (or yearly) payments as sort of a rent that you pay in order to have your store present online. If you would like to consider the value in terms of a star rating, I would give the platform 4.5/5. Full 5 stars would probably require the platform to be free to use, which is not obviously practical from the company's perspective and likely never going to happen with any high quality e-commerce platform. This review was last updated 11th of February 2018. It will continue to be frequently updated as time goes on.